The Indian Women’s Hockey Team qualified for the next stage of the Vitality Hockey Women’s World Cup London 2018 as they draw against World No.7 USA in their third Pool B match here at the Lee Valley Hockey and Tennis Centre on Sunday. The Indian team displayed great character and a solid defensive structure throughout the match to earn the draw as Captain Rani (31’) cancelled out Margaux Paolino’s 11th-minute goal. India started the match on the front foot as they showed some quick passing, but had a scare in the 4th minute when their Captain Rani was forced off with a twisted ankle. The World No. 10 team won their first PC of the match in the 7th minute, but Gurjit Kaur’s flick was saved by USA’s Goalkeeper Jackie Briggs. India dominated possession and pressed the Americans but the 11th minute saw USA take the lead as Indian Goalkeeper Savita was called into action when Erin Matson’s shot was saved by the shotstopper, however the rebound was put into the back of the net through Savita’s legs by Margaux Paolino. India looked for an equaliser and were threatening the USA defence with some good build-up play; winning their 2nd PC in the 14th minute, however the resulting drag-flick taken by Gurjit was saved by Briggs. India won another PC through striker Navneet Kaur with 32 seconds to go in the first quarter, but Gurjit Kaur’s flick went just wide of the target as USA ended the period with a 1-0 lead. The second quarter saw India have a chance in the early stages but Rani’s shot was intercepted by an American defender. In the 18th minute, USA won their first PC of the match but the flick was well saved by Savita. India won their fourth PC in the 19th minute, but Rani’s fierce flick down the middle was deflected away by Briggs. India maintained their attacking flair throughout the second quarter and made sure that they defended their lines well, making well-timed tackles. In the 28th minute, USA were dubiously awarded a PC which saw India lose their referral. 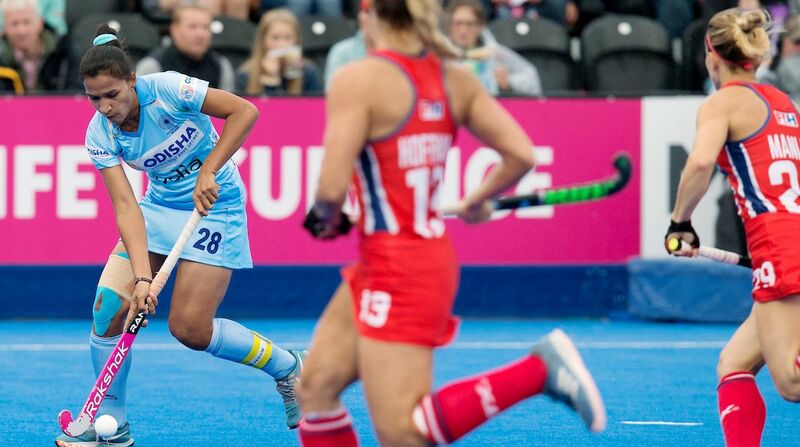 The resulting dragflick was hit wide and with 44 seconds to the half-time break, USA won another PC which was saved by Savita with her legs as USA maintained their one goal advantage. The beginning of the third quarter saw India win a PC in the 31st minute as Rani flicked the ball onto Michelle Vittese’s foot inside the striking circle. It was the Captain herself who struck the resulting flick and brought India back into the match as her crisp strike flying into the back of the net even though Briggs got her right hand to it. India displayed a great defensive structure throughout the third quarter as they denied the USA any opportunity to create chances. In the 43rd minute, India’s Sunita Lakra made a crunching tackle in her own striking circle to deny Michelle Vittese a shot as Savita cleared the ball. India started the fourth quarter on the front foot and had the opportunity to take the lead as they won their sixth PC in the 47th minute, but the resulting flick by Gurjit Kaur was saved by Briggs on her right side. The 50th minute saw Udita create a good opportunity for herself as she took a shot on the reverse, but the shot was deflected off a USA stick for a long corner. India created constant pressure on the World No. 7 USA team and the next few minutes saw India produce a good defensive performance as their opponents tried to create chances. With just a couple of minutes left on the clock, the Indian team looked determined to keep the draw intact as it would be enough to take them through to the crossover match. USA took a shot in the striking circle with just four seconds to go, which was defended well by the Indian team to make sure that the match ended as a draw. The Indian Women’s Hockey team will play a Crossover match depending on the result of the match between Ireland and England.